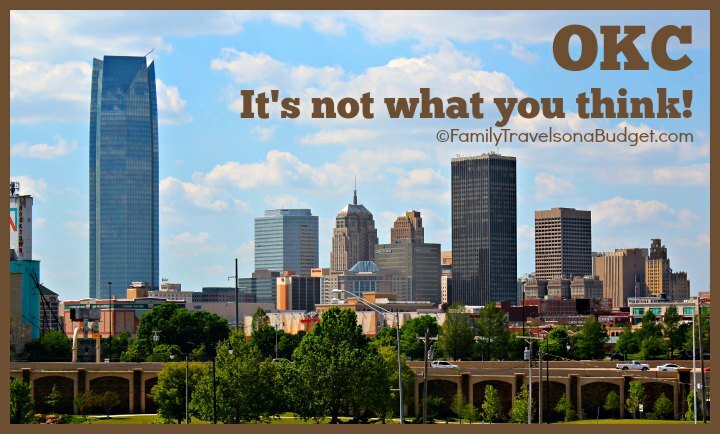 Home » Destinations » OKC… It’s not what you think! OKC… It’s not what you think! Thanks to #OKC for hosting my visit! If you think Oklahoma City is all cowboy boots and desert landscape, well, you’re partly right! People in OKC wear cowboy boots with everything, dresses, shorts, jeans and dress clothes. Oklahoma City is about as country music fashion as it gets. And, most of the year, OKC has a fairly desert-like appearance, but not in spring! It’s gloriously green in the spring. Now, if you’re like me and don’t much else about Oklahoma City, read on. I think you’ll be as surprised as I was! Get to know Oklahoma City! First and foremost, the people of Oklahoma City love their basketball team! “Thunder up” doesn’t refer to the storms that can ravage the area, but is the rally cry of Oklahoma City Thunder fans — the city’s beloved NBA team! The Oklahoma City National Memorial & Museum. Twenty years ago, Oklahoma City made national headlines when the federal courthouse was blown up in an act of domestic terrorism. What these domestic terrorists meant to ruin the city, became its rallying cry. To really understand what makes Oklahoma City such a close-knit community, visit the Memorial. The Survivor Tree was severely scorched in the blast. It survives, a living testament to survival. The National Memorial Museum is housed in the building in the background. In recent years, Oklahoma City has committed to revitalizing the city to make it a more attractive place to live. Of course, those same changes make it a great place to vacation. I know — there’s no beach, no mountain and it’s not a BIG city! But it is a great place to take the kids on vacation! Bricktown. 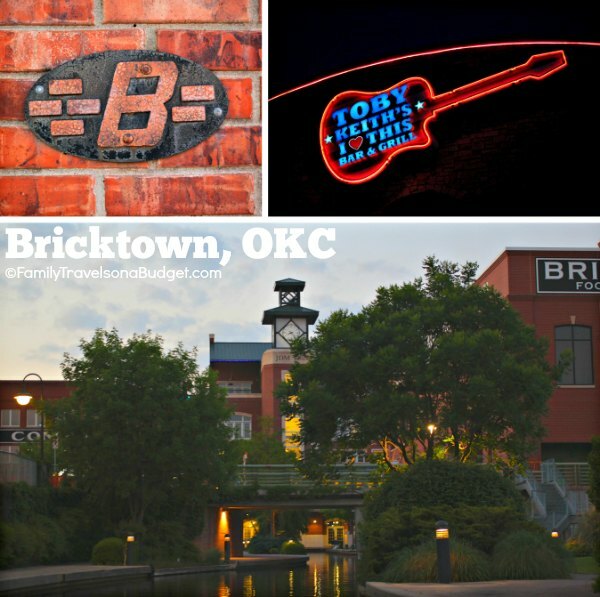 Once home to warehouses, Bricktown is THE SPOT for nightlife and entertainment in OKC. The area centers around Bricktown Canal, offering both wide pedestrian walkways and the Bricktown Water Taxi to navigate from one end to the other. Along the walkway enjoy restaurants, theaters, entertainment options for families, bars and baseball at the Chickasaw Bricktown Ballpark. The Boathouse District. Set along the Oklahoma River, this area offers outdoor recreation the whole family can enjoy. Bring a picnic and watch the US Olympic and Paralympic teams train for rowing and canoe/kayak. Better yet, take a kayak, dragon boat or paddle board out on the water yourself. Bike trails along the waterfront offer landlubbers a safe place to cycle. Or, do what I did, and get back in touch with your childhood on the ropes and climbing course — and come down by zip line across the river (and back). Some activities cost money, but others, like the covered children’s playground, are free. 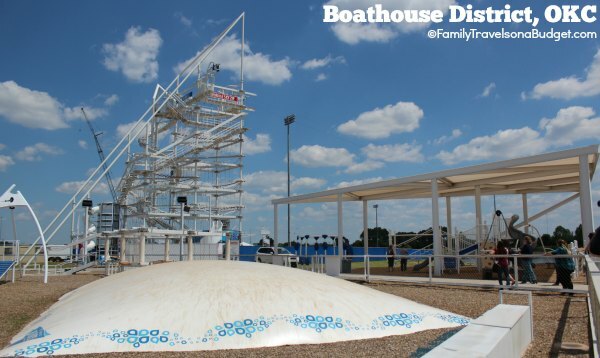 The tall structure is the ropes course and zipline platform (fee required). The white “bubble” in the foreground is an inflatable bouncer in the kids’ zone (fee required). The covered area on the right is the children’s playground (FREE). Midtown. Just north of the downtown business district, local business owners in Midtown have changed the vibe in this area. Midtown really shines at “H&8th” a fourth Friday tradition that brings food trucks, entertainment and people (dogs too) to the area for dinner and fun. As H&8th has grown, so has this district. Get coffee at Elemental Coffee, enjoy dinner at Ludivine or unwind with friends at The Bleu Garten, an open air bar and food truck destination with flat screen TVs to watch the Thunder (and college football)! Get the Oklahoma City Visitor’s Guide to plan your vacation. The Oklahoma City Visitor’s Bureau offers vacation specials and packages with travel partners to help you save. 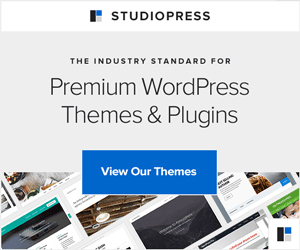 Check the website for current offers. While Oklahoma is known for bad weather (maybe that’s why their NBA team is the Thunder), the city actually averages more than 300 sunny days per year. The sun shined brightly during my five day visit mid-spring. Mild temperatures year-round mean it’s a great place to visit anytime. Three interstates serve Oklahoma City: I-35, I-40 and I-44. Surprisingly, it’s only an 18 hour drive from Raleigh, North Carolina, much closer for most of the country! I really thought it was farther than that — so I see a return road trip in my not-so-distant future. Thanks again to the OKC Visitor’s Bureau for hosting my visit and introducing me to Oklahoma! Oklahoma City seems like a great place to visit. I agree that I worry about the weather but it sounds like it has a lot of days that are sunny. Most days. 🙂 Of course, the tracking rain the past month has skewed that. Maybe the rest of summer is perfect! This is awesome information about Oklahoma City. 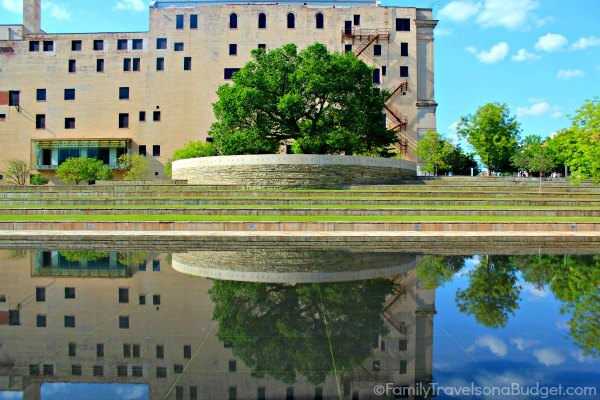 If we ever go that way in our travels, we will definitely be stopping at the Oklahoma City National Memorial & Museum. I didn’t know their weather was as good as it is either. Thanks for sharing. I hope you make it there, Rebecca. It’s a great city! There’s so much to see. I would love to visit it some day. Although it would be very sad, I would really like to visit the museum and memorial. What a sad thing that was. I’ve been to many memorial type museums, and of them all, this may be the least sad. The tragedy itself was absolutely horrific, one I remember well. But, the way they designed the memorial tells the story by timeline. You can explore from a number of different points of view: victim, first responders, media, police. I came away from it, hushed by the tragedy’s enormity, but with a sense of victory. The people of OKC did not let this event define them, but rather to sharpen their already strong resilient nature. I think the recent weather incidents in nearby Moore exemplify the spirit of this place. It’s an amazing testament to the heart of OKC. Wow, this looks really awesome; it would be nice to visit Oklahoma . I haven’t been to Oklahoma City even though my aunt and uncle live near there. I love the reflection ponds. Thank you for sharing your adventures, it’s been raining like crazy in Texas. I’ve been watching your rain. OKC is getting it too. I hope all is well with you and that the summer settles down! What a fun road trip. I don’t think I would have thought to go to OKC. I would love to see that memorial. I imagine I would shed some tears though. It looks beautiful. I really had the wrong impression before I went, both about OKC and about the Memorial. I’ve been to holocaust memorials, war memorials and civil rights museums. This one, of them all, shared the information in a way that even elementary kids could understand at some level and without being overwhelmed. They did a tremendous job telling the story, even the story of the trials and convictions. I remember the Oklahoma City bombing. It was such a tragedy especially with the daycare center that was involved. I love the survivor tree and look forward to making a visit to see everything OKC has to offer! The bombing was just before my oldest child’s first birthday. It was such an emotional time for our country. OKC has not allowed that tragedy to define them, but rather to remind them how precious their community is. It’s a big city with a bigger heart. So different from anyplace else I’ve been. I would LOVE to visit OKC one day. Sounds like a fun place to visit. It was so much more fun than I expected. I’m really glad I went!